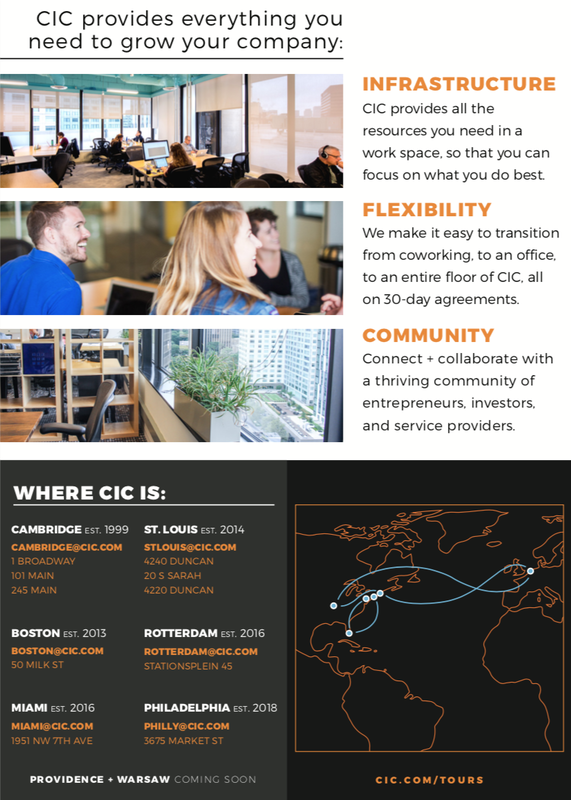 CIC's visuals should evoke a vibrant and professional feel. Large beautiful photos are prominent. They should be bright and high contrast, giving the sense that our spaces are full of light! Main headers should be set in Montserrat Bold. Subheadings are set in all caps with generous spacing (50+ px). Body copy for print should be Montserrat Light. Links, email addresses, etc are generally CIC orange, Montserrat Semibold. CIC's classic logo is set in Museo Bold (but we do not use Museo for other text). CIC Rotterdam's logo is set in Montserrat Bold. Use icons from the approved icon set. Grey icons are for maps usage. Black and orange icons are for display purposes such as wayfinding, signage, or web. CIC Orange should be used strategically, and often works best as an accent, with grey or white doing much of the heavy lifting. Avoid orange on black, which can cause a "holloweeny" feel. Plentiful white space is your friend! Text should be black, white, or CIC Orange, and considered for accessibility and contrast so that it’s legible for anyone. As our primary graphic symbol, the CIC logo must appear on all communications, including websites, print publications, stationery, and signage. Our logo is a graphic element, not text, and should not be used in place of the letters “CIC” in text. Please also refrain from using Museo Bold in other contexts (eg, body copy for posters). The CIC logo may occasionally be used as part of a logo for an initiative. These instances are subject to approval by the Marketing Team. Click to download .EPS versions.